You either love it or hate it and when it comes to Aunty Jack and for those connoisseurs of the television series, another gem has finally landed on DVD which features four of the main characters from the series on their own. The first installment features live footage from the 1974 National Concert Tour "In Bloody Concert" which has Aunty Jack and Thin Arthur trying to save the day by stopping Kid Eager from stealing the Golden Glove and become the grandmaster of the concert. As previously mentioned, the comedy of Aunty Jack is really a hit and miss and unfortunately the comedy of the series has dated considerably but for those wanting a tour down memory lane, this DVD is definitely worth the admission price alone. Some of the ideas that this duo come up with virtually had me in hysterics but needless to say, the maturity level on this segment was extremely low. Other segments on the disc include Ken Kavanagh which sees the world through the eyes of a meat butcher and the Farrelly Brothers who take their singing sheep to New York that actually had me smirking throughout this skit and last but not least... our favourite, Norman Gunston who is kidnapped by the Chinese. 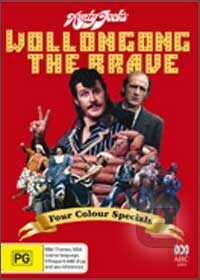 With a variety of laughs and enough moments of nerve racking silence, Aunty Jack's Woollongong the Brave is one strange DVD that I strictly recommend for lovers of classic Australian comedy. Live footage from the 1974 National Concert Tour “In Bloody Concert.” Aunty Jack and Thin Arthur foil Kid Eager’s attempts to steal the Golden Glove and control the show. The history of the world, as seen through the eyes of a butcher. Kev goes creatively out of control under the influence of meat when his dad turns into a veggie. Country and Mediterranean music exponents the Farrelly's and their singing sheep Jason travel to New York City to seek fame, fortune and fodder. Wollongong's only reporter, Norman Gunston, is mysteriously kidnapped by the Chinese? What do they plan to do with the "Gong's" secret weapon?